Pull apart bread is a favorite in our house especially around the holidays. There are so many variations that you really can't go wrong. Last week we had an unexpected cool front in North Texas, so baking a sweet treat was first on the agenda. 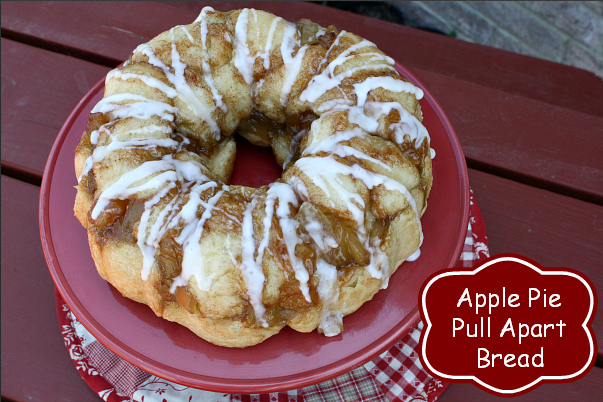 I settled on a sweet bread and surprised my family with this easy Apple Pie Pull Apart Bread. 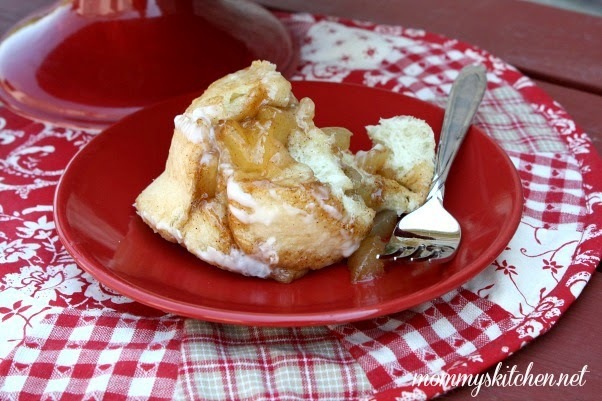 This recipe has all the flavors of apple pie in a cinnamon bread form. This delicious bread starts with simple frozen Rhodes Dinner Rolls and a handful of ingredients. Frozen bread dough is great for so many shortcut recipes and no one will ever guess it isn't homemade. This apple pie bread is great for a quick treat or paired with a savory breakfast casserole for overnight guests. If time isn't on your side you can prepare this recipe the night before, place it in the refrigerator, and bake in the morning. Everyone will enjoy this ooey gooey apple cinnamon bread. 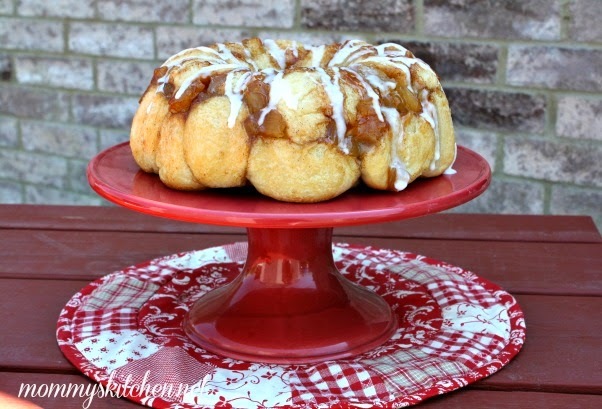 If you would like to know how to make this recipe click over to the Rhodes Blog where I'm sharing step-by-step photos and directions for this easy Apple Pie Pull Apart Bread. I have also included a .50 coupon below good towards any Rhodes frozen dough product. Click on the coupon to print. Spray a standard bundt pan (10-12 cup) with non stick spray. Cut each roll in half and arrange half of the dough pieces on the bottom of a Bundt pan. You can also add a mixture of cinnamon and sugar to a large Ziplock bag and cover each dough piece before adding to the pan (see cook's note). In a separate bowl, mix the pie filling, brown sugar, cinnamon, vanilla extract and melted butter. Mix to combine. Add half of the apple mixture over the dough pieces, add the remaining dough pieces on top, and add the remaining pie filling. Spray a piece of plastic wrap with non stick spray and lightly cover the pan. Set in a warm place to rise until double in size and almost reach the top of the pan (about 1 1/2 hours). Don't let the dough rise more than that, because it will continue to rise when baked. Remove the plastic wrap and place pan in a preheated 350 degree oven and bake for 35-40 minutes or until the rolls are golden brown and cooked through. Remove from oven and cool before adding glaze. To make the glaze: Add the melted butter to medium size bowl. Add the powdered sugar, vanilla and milk. (Start with 1 tablespoons adding more only if needed). Use a wire whisk to mix the ingredients together. You want a semi thin consistency. Drizzle over cooled bread. Cook's Note: For more cinnamon flavor, mix 2 tablespoons cinnamon and 1/2 cup granulated sugar together in a large zip lock bag. Cut the rolls in half and place them in the cinnamon sugar; shake well making sure all pieces are covered, and then arrange in Bundt pan. This is a sponsored post by me on behalf of Rhodes Bread Company. I'm a contributing guest blogger where I share recipes and ideas using Rhodes Frozen Dough Products. How would I adjust this using cherry pie filling? For cherry I would just use the pie filling as is and omit the cinnamon and brown sugar. I would maybe add a bit of regular sugar so the cherry filling isn't so tart. For the glaze use almond extract in place of vanilla. If you like you can even add a some finely sliced almonds on top. Oh my goodness, this looks so delicious. Would love that with some dark coffee. Looks Absolutely Amazing and could use a nice pick piece to go with my morning coffee. Love your cake plate (red is my color) :}as well as that round red and white placemat. Did you make that round placemat? Thanks 4 sharing your wonderful recipes. This looks wonderful! My husband walked by and said he'll have a piece! But it looks like you started with the pie filling, or does it just seep through? I want to make it today. If you put in fridge overnight, do you let it rise first? No, after you assemble the bread. Cover with plastic wrap that has been sprayed with non stick spray. Then place the baking pan in the refrigerator and it will rise on it's own. Thanks Tina. I made it on Saturday night and baked it. Frosted it on Sunday morning. Brought it to church breakfast and it was devoured quickly. Very good. I will try next time putting in fridge and baking in the morning. You said it will rise there. That way it will be warm next time. Thanks again. I love pull-apart bread, would love to make yours, but I live in Australia and we do not sell Rhodes dinner rolls. Do you have a recipe for these dinner rolls. Any dinner roll recipie will work. Hi Australia. I miss Brisbane. Is the tablespoon of butter melted first? Could I use fresh apples instead of apple pie filling. Size of bundt pan? They come in different sizes. That info needs to be stated like other baking size pans being used. Can an angel food pan be used if bundt pan not available.